The President was speaking at the Adampur frontier air force base after awarding standards to two squadrons of the Indian Air Force at an impressive ceremony here. ADAMPUR (PUNJAB): President Ram Nath Kovind on Thursday said that while the country remained committed to peace, it is determined to use all its might to protect the sovereignty of the nation. "Though we remain firmly committed to peace, we are determined to use all our might to protect the sovereignty of our nation. "Our armed forces, exemplified by our air warriors, reflect our national resolve. And they secure the values embodied in our Constitution," the President said. Citizens have a sound sleep knowing that the borders were in the safe hands of "our brave defence personnel", said Kovind. The President was speaking at this frontier air force base after awarding standards to two squadrons of the Indian Air Force at an impressive ceremony here. The standards were awarded to the 223 Squadron (Tridents) and 117 Helicopter unit (Himalayan Dragon) for excellence. 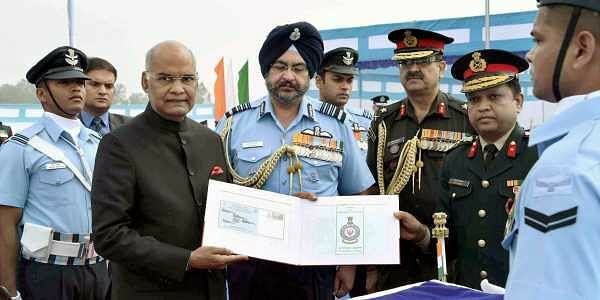 Kovind, on his maiden visit to Punjab after taking office, inspected a guard of honour at the forward air force base. "...Proud to be Supreme Commander of the magnificent men and women of our valiant Air Force," the President tweeted later. "The contribution of Punjab to our armed forces has been enormous. That is why, in my role as the Supreme Commander of the Armed Forces, I am truly glad that my first visit to Punjab has brought me to the Air Force Station in Adampur," he said. He said the Air Force Station Adampur is among the "oldest and best-known bases of our Air Force". It was the setting of great heroism during the wars of 1947, 1965 and 1971. "This is my first visit to Punjab after taking over as President of India. This is the land of sainiks and sants. Especially fortunate to come here in November, a month that marks birth anniversary of Guru Nanak Devji and martyrdom of Guru Tegh Bahadurji," the president said. "The 223 Squadron is one of the few that remains alert 365 days a year. It truly lives up to its motto of Vijaya Amoghastraha, which means the Ultimate Weapon for Victory," he said in another tweet. "In Operation Rahat, Operation Megh Rahat, and numerous other humanitarian assistance and disaster relief missions, 117 Helicopter Unit has worked tirelessly in helping civilians," he added. The IAF gave an impressive aerial display on the occasion. Punjab Governor V.P. Singh Badnore, Air Chief Marshal B.S. Dhanoa and several dignitaries were at the event.